Bob Gale, the writer of Back To The Future Part II, has confirmed that the villain, Biff Tannen, was based on another power-hungry loudmouth with terrible hair, Donald Trump. The Daily Beast presents some of the similarities between Trump and the version of Tannen in Part II who essentially rules Hill Valley in a darker, alternate 1985: “He’s been handed the keys to fortune, he’s unrepentantly used that fortune exclusively for himself, and he’s even become a public advocate for plastic surgery for women in his family.” And, of course, Tannen uses his power to force himself into politics and turn Marty’s home into a gun-addled (but immigrant-free) wasteland. When the Beast asked Gale if the similarities were intentional, he answered, “Are you kidding? … Yeah. That’s what we were thinking about.” He continued, “You watch Part II again and there’s a scene where Marty confronts Biff in his office and there’s a huge portrait of Biff on the wall behind Biff, and there’s one moment where Biff kind of stands up and he takes exactly the same pose as the portrait? Yeah.” Gale stopped just short of saying, “So obviously, he must be stopped.” Perhaps Gale is worried that Trump has a time machine and will go back in time to kill his father and buy his mother fake breasts. 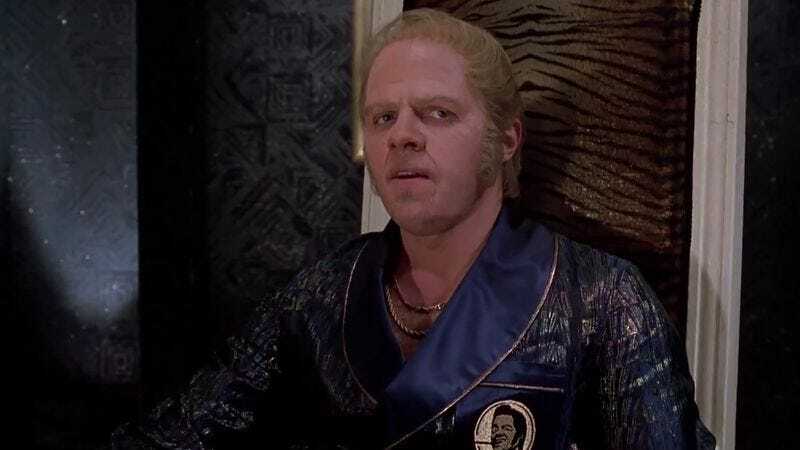 Since the Back To The Future films are so well loved across America, whenever you encounter someone who is voting for Trump, just say, “You mean you’re voting for Biff?” That should sober them. But if it doesn’t, someone should change the text on the teleprompter during Trump’s next speech and make him to say, “Two McFlys with the same gun.” That’s the kind of evidence no one could ignore.